Windstar Lines has provided premier corporate charter bus rentals throughout the country since 1995. As a family owned and operated company, we place a strong focus on safety and customer service, making sure your company outing runs as smoothly as possible and is enjoyable for all employees. Our extensive fleet allows us to customize the perfect trip for your next corporate event, whether that be a small group of individuals heading out for a congratulatory day trip or the entire company traveling to a conference across the country. Let Windstar Lines alleviate part of the stress of planning a corporate outing by taking care of your transportation needs. Are you thinking of another type of trip for your next corporate outing? No problem! Contact us today and we will help you plan just about any trip you can imagine. 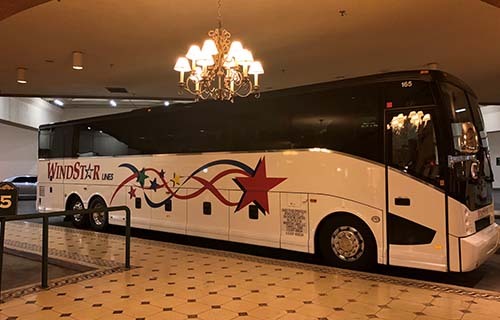 Value: Renting a charter bus for your company outing will not only save you money, as you pay one quoted cost, but it will also save you time and hassle that you would otherwise have to deal with by coordinating your own transportation. When you book a trip with Windstar Lines, we are able to transport your group to hotels, conventions, across town for day trips, and more. Don’t worry about taxis, walking, or private transportation. Windstar includes it all! Customization: With a fleet to transport a handful of employees or a few hundred employees, Windstar has the capability to customize your trip just as you see fit. This also goes for side trips and excursions you may want to schedule along the way. If you can dream it, we can make it happen. Customer Service: Our corporate outing specialists will be there with you every step of the way, so you don’t have to worry about what time we will actually show up or where you are headed next. From the sales specialists to the tour operators, the team at Windstar Lines will provide you with exceptional customer service to make your trip run seamlessly.